Everyone who knows me knows I LOVE doll stamps!! They are my favorite things in my craft arsenal. 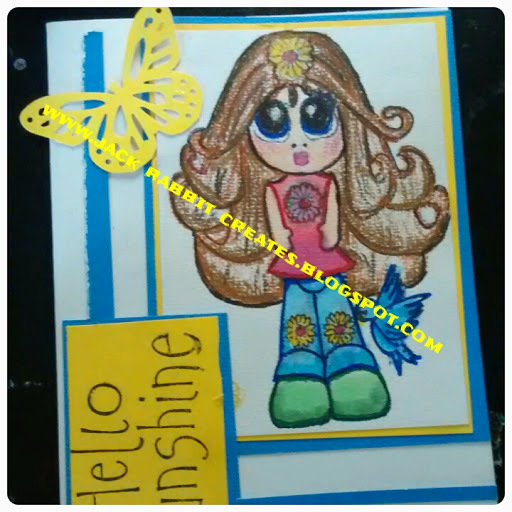 I have journals after journals just filled with pages of mixed media stamped doll entries. So naturally when Sunsational stamps introduced their dolls I was ready to have a go. So I chose " precious " for this project. She's a polymer stamp. I used black memento ink on white card stock. I have colored her using prisms colored pencils and shaded and out lined her image with fine tip sharpies. The flowers that are used have been cut from a punch by EK success. Im not sure I done this image justice... But I had a blast creating with her. 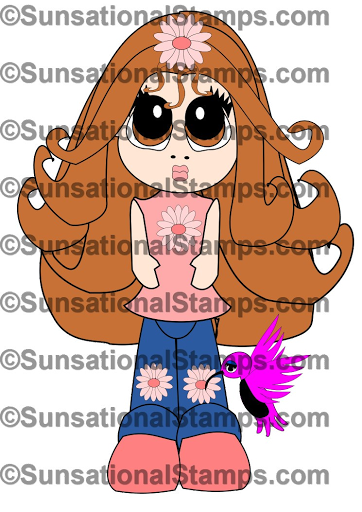 If you like doll stamps as much as I do then you really need to check out some of their new girl images. I think they are adorable and I love creating with them. I haven't got around to paper piecing the outfits yet. ( because I totally need the practice on shading ) but that's in my future lol. As you knew it would be lol. While your there look through all the other adorable images available. Thanks for stopping by my little crafty space and checking out my project. See ya soon... Happy creating! !